Freshly returned from East Coast travel and on the morning of Seattle’s annual day of worker rights activism, Mayor Ed Murray is said to be ready announce his office’s proposal for raising the minimum wage in Seattle to $15. “This is a plan, not of trickle down … but of building the middle class from the middle out,” Murray said at his City Hall press conference. The mayor said that minimum wage workers in Seattle would make $6,000 more a year than minimum wage workers in the rest of the state. Murray was joined by the committee co-chairs, CEO of the Seattle Hospitality Group, Howard Wright, and labor leader David Rolf. “The employer community didn’t get everything we wanted, but neither did anyone at the table,” Wright said. Craig Dawson, president of Retail Lockbox, was announced as the lone ‘no’ vote on the committee. “March in the May Day demonstrations this afternoon,” Sawant said, calling on supporters to continue fighting for a stronger, faster path to $15. Sawant said the plan she supports would have no phase-in for big businesses, a shorter three-year phase-in for small businesses and nonprofits, no tip credit, and no health care credit. Sawant said she will “push the City Council to correct the proposal” as it begins assessing the plan and moving toward legislation. Issues like a training wage and exemptions for non-profits, once thought to be major sticking points, were not major concerns for the task force, Rolf told CHS. Over the past week Rolf said much of the negotiating hinged on the definition of health care and the cutoff for large and small businesses. In the end, the task force decided employers must provide at least Silver-level healthcare under the Obamacare ranking system to qualify for the minimum wage credit. Small businesses are also given a “minimum compensation” schedule, meaning that all small businesses must get their workers to $15 an hour through some mix of wages, tips, and health benefits by 2019. “It’s a highly complex solution, but it’s a compromise for both sides,” Rolf said. And while it may seem a stretch to call a business with 500 employees “small,” Rolf said that too was a compromise. He said some companies wanted local head counts to determine their size, meaning companies like McDonald’s would only have to count the number of workers the had in Seattle. Some 100,000 Seattle workers who make the state mandated minimum of $9.32 an hour would start to benefit from the mayor’s proposal by 2015, with many seeing an increase to $11 an hour. 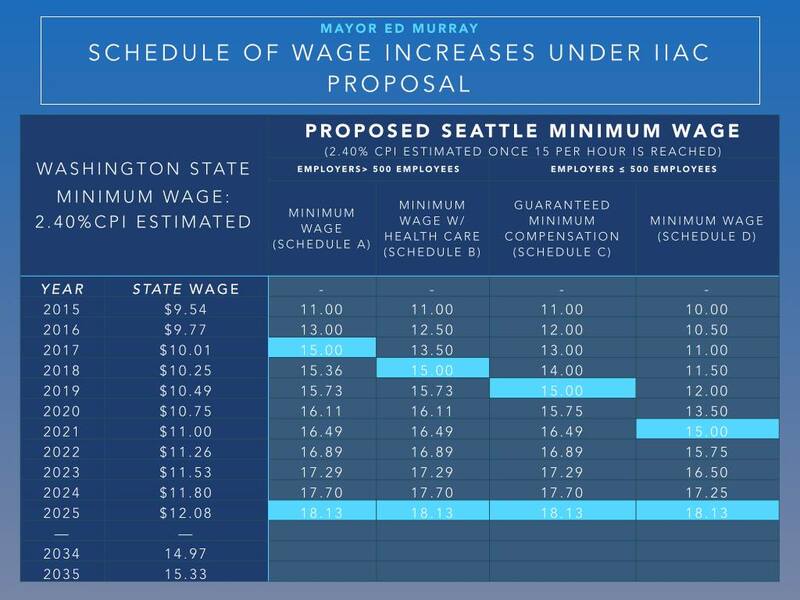 Low wage workers in small businesses that have tips or healthcare, which would include many in Capitol Hill’s food+drink economy, will see their wages increase to $10 an hour in 2015. Fast food workers and other low wage earners for large companies would see their wages increase to $15 an hour by 2017. The focus now shifts to City Council which will ultimately write and vote on a plan to raise the minimum wage. Councilmembers stated they will begin reviewing the mayor’s plan on Monday. Meanwhile, a charter amendment has been filed by the 15 Now group so activists could begin the process of collecting thousands of signatures to put the issue on the ballot this fall. Original report: A news conference has been scheduled for City Hall for 10:30 AM. Later in the afternoon, thousands of marchers will pass through the core of the city to downtown to bring attention to worker and immigrant rights as police prepare for the annual return of violence by anti-capitalist and anti-police protestors. Last week as a milestone came and went without agreement on recommendations from his committee of labor and business interests convened to provide guidance on the wage, Murray held a press conference to say the framework of a deal was in place. CHS reported that people involved with planning the proposal said the plan will offer a two-pronged approach for both small businesses and large, 500+ employee businesses. Small businesses offering health insurance or with tipped employees would get to count those benefits towards a minimum wage and get seven years to phase-in all employees to at least $15 an hour. Small businesses with no health insurance or tipped workers would be given a five-year phase-in period. Large businesses would face similar options, with a four-year phase-in for employers of tipped or insured workers, and a three-year phase-in for those without tipped or insured workers. Capitol Hill Chamber of Commerce director Michael Wells and and Lost Lake owner David Meinert are members of the Income Inequality Advisory Committee. The minimum wage negotiations have also reportedly set the framework for the next phase as the City Council must approve the final legislation. The process to achieve consensus on the committee recommendations was also an effort to galvanize the business, labor and nonprofit groups involved to support the plan once it is taken up by Council later this year. The mayor will veto any legislation that significantly deviates from the final recommended plan, a source involved with the discussions but not yet authorized to speak with the media told CHS. A flurry of groups and coalitions have formed around the city in recent months to weigh in on the issue after the Kshama Sawant-backed 15 Now campaign dominated much of the early debate. The new Council member made the issue a key part of her campaign in defeating a longtime incumbent and has been critical of Murray and City Hall’s progress on the issue of income inequality in the city. Thursday morning, the mayor was also asked why his office opted to make an announcement about the minimum wage deal on May Day as the day’s events of activism and potential unrest were about to unfurl. The agreement, the mayor answered, was wrapped up Wednesday. With an administration so far plagued by leaks to the media, Murray said the cat would have been soon out of the bag. “It’s easier to keep secrets in Olympia than it is in Seattle,” Murray quipped. It’s not exactly what I would have hoped for, but this is what compromise looks like. Good job to all of those who worked so hard to come up with something. It’s too bad the other Washington can’t be as productive. So after this phase in period no more tipping? Sounds good. Tips aren’t mandatory now and let me guess, notips..you aren’t the most generous tipper anyway. What do you care? I routinely tip 15 – 20%. Not anymore. At least not in Seattle. And guess what? I won’t feel bad about it at all. Please enlighten me – why the hell should some food slinger, who makes $15 an hour – that’s $30,000 a year full-time – get a tip?? Please tell me why. I will stop tipping as well. Pingback: First Hill McDonald's walkout kicks off Seattle fast food strikes — Early ... - McDonalds KortingsBonnen voor iedereen!